What Happens When You Do a Chemical Analysis on the Durian Fruit? The Durian fruit is famous for being a botanical stink-monster. How does it put off such a rich array of offensiveness? We’ll tell you the results of a chemical analysis. Durian, with its outer spikes, its inner slime, and its arsenal of odors, is an example of what can only be termed edible Stockholm syndrome. Even the people who love it admit that its smell is so horrible that the fruit should never be eaten in public. That bad smell has caught the attention of chemists, who know that it can’t be the work of just one or two chemicals. It is an extensive trove of foul scents. One analysis suggests, though, that it’s not the quality of the scents that make the durian so unbearable. The analysis was done by solvent extraction. Solvent extraction involves the extremely sophisticated technique of taking two liquids, one of which contains the many components that need to be analyzed, putting them both in a container, and shaking the crap out of them. This can help tease out and isolate individual chemical components. The trick is knowing which liquids to use. Firstly, the two liquids must be immiscible, like oil and water. Secondly, if the “water” contains some chemical component that the researchers need to analyze, the “oil” needs to have a higher solubility for that chemical than the water. This will cause the component to dissolve into the oil, which separates out from the water again, allowing the researchers to analyze the chemical one its own. The process takes time, repetition, and guesswork. It can pay off. 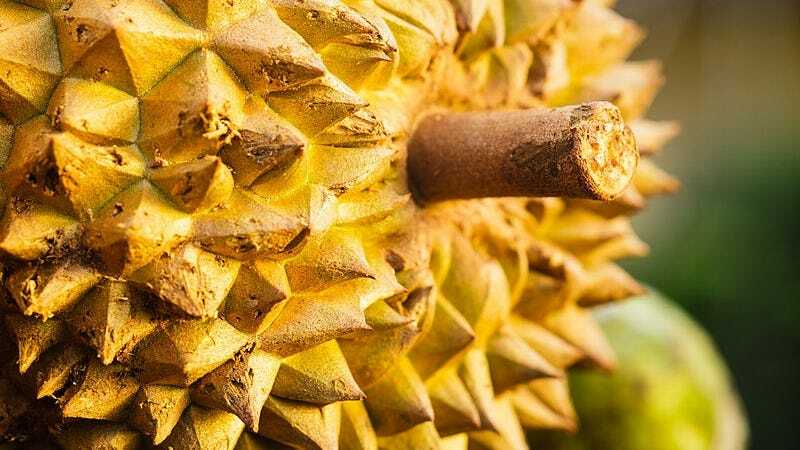 In the case of the durian, researchers found a number of chemicals known to be hard on the nose—like hydrogen sulfide and methanethiol. They also got a number of volatile chemicals associated with two different categories of good smell: onions and sweets. In the sweet category they found stuff like ethyl cinnamate, which smells like honey, 4-hydroxy-2,5-dimethylfuran-3(2H)-one, which smells like caramel, and acetaldehyde, which smells fruity. Meanwhile, they also found 1-(ethylsulfanyl)ethanethiol, which smells like roasted onions, 1-(ethyldisulfanyl)-1-(ethylsulfanyl)ethane, which smells like sulfury onions, and ethanethiol, which smells a bit like rotten onions. There were many other compounds in the fruit. Some smelled like soup seasoning and others like fruit—and all like things that didn’t belong in the same place. The durian would make a very nice savory-smelling fruit, and a very nice sweet-smell fruit. The problem is it tries to be both at once. This may be what makes it so horrible.